I remember as if it were yesterday. It was a hot summer day and as usual, I was shirtless and shoeless. My little five-year-old feet carried me into our small storage room where I was determined to find out why my Dad had warned me; “Never stick anything into a wall socket.” I had a screwdriver in my hand. Two small steps led down to the cement floor storage room where the wall socket stood, waiting, next to an old refrigerator. Light shone through the open door illuminating the 110 voltage receptacle of electrons and protons. It was calling to me. I walked over and slowly moved the long flathead toward the socket. “Yes, yes,” it whispered. A trickle of sweat ran down my face as the tip of the screwdriver entered the small hole. Nothing. “Further,” it called to me. I gripped the screwdriver tight and pushed. The next thing I knew the outlet reached out and grabbed my hand and violently squeezed so tight I thought my hand would crush. At the same instant, proton and electron minions flew out of the outlet with an evil laugh and started jabbing my arms, shoulders, and legs with millions of tiny needles. I tried to let go of the screwdriver, but the wall socket just sneered and shook me so hard my teeth rattled. I tried to scream, but the protons had zapped all the air out of my lungs. At the same time, the electrons opened a valve without my permission which allowed a rapid flow of a certain fluid to exit my body. I would later try to blame the dog for that particular mess, but my soiled pants and frizzy hair told a different story. After what seemed like several hours but in reality was only a few seconds, the evil socket simply let go and slunk back into the wall. The angry protons and electrons sat around pricking my skin for a while, but finally left leaving behind wobbly legs, ashen skin, and glazed eyes. When I was finally able to catch my breath, I let out a blood curdling scream that caused my Dad to leap some 10 feet into the air before running to my rescue. 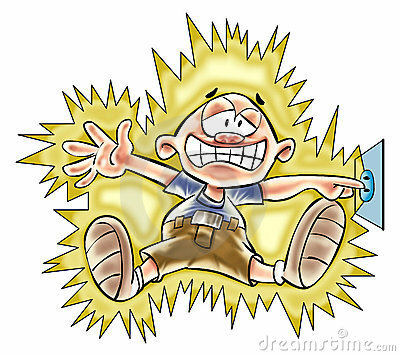 I don’t remember much else about that little experience, except thinking I was surely going to be in big trouble for disobeying my Dad and almost electrocuting myself. Instead of being punished, however, I remember lots of hugs and kisses that day. Even, I think, an extra scoop of ice cream. While I learned my lesson and am pleased to say I have never again stuck anything into a wall socket, I still find myself standing there “holding a screwdriver.” It’s just that today, the “wall sockets” calling to me are completely different. God provided us a list of 10 rules to live by and to paraphrase said, “Listen to me, my child. I’m telling you this because I love you and know what will happen if you disobey. Don’t have any other god but me. Don’t misuse my name or try to replace me with some worthless idol. Don’t murder or commit adultery. Don’t steal or lie or even covet what someone else has. Honor your father and mother and remember the Sabbath and keep it holy” (see Exodus 20). The notion that God’s rules cramp our lifestyle or keep us from enjoying life “smells like smoke,” as my old pastor was fond of saying. The truth is, God knows exactly what happens when we stick screwdrivers in wall sockets. He gave us His rules because He loves us, wants to protect us, and wants the very best for us. Now…if we would only just listen.